Gordon Close trained as a sculptor and his work, which is now predominantly paintings and drawings, has originated from the working drawings he made for life-sized figure compositions; sculptures that were fashioned from traditional materials referring to, and making heavy use of, classical imagery. Now the drawings and paintings are of a world that embraces the domestic and everyday as well as historic (personal and in the wider sense), folklore and myth. Narratives inhabiting a familiar timeless interior or pastoral landscape often contain subtle references to the earlier sculptures. The collaboration with master printer Lee Turner and Hole Editions has explored again these themes and subject matter. Some of the images have taken the title or lines from traditional songs as their starting point ('Stepping on the Floor', 'Oh Shenandoah'), all are a catalogue of events, recollections and memories. The challenge has been to make these images work as lithographic prints. The use of a base colour and the orange/red under drawing are references to, and characteristics of earlier work, but the scale, how colour is used, the texture of the ink and the use of line were decisions that had to be made for each print and this is where the project has been fully collaborative. Gordon Close received Northen Arts Awards in 1983, 1984 and 1986. 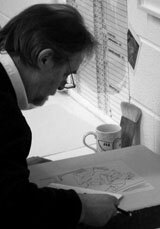 He taught at Sunderland University College of Art & Design from 1993 to 1999 and has exhibited at: Aspex Gallery, Portsmouth; Yorkshire Sculpture Park; Broadgate Arena, London; Queen's Hall, Hexham; Blackheath Gallery, London; Sally Hunter Fine Art, London.